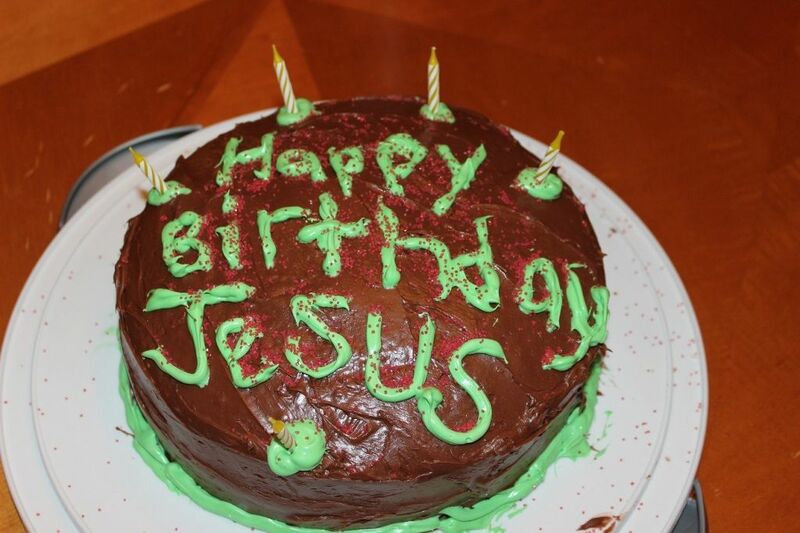 Our last Christmas celebration was on Christmas day. After our fun-filled morning at home, we dressed the boys, loaded them in the car, and headed to Grandma's (Daddy's mom's family). 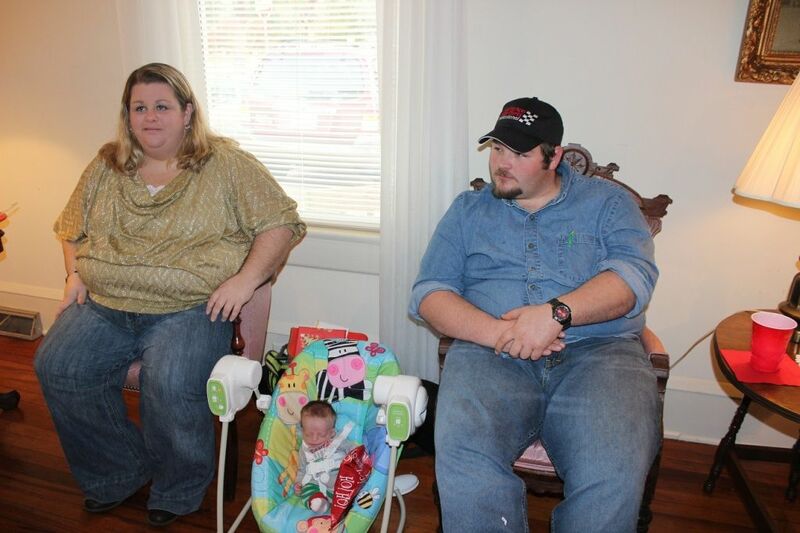 Daddy's family has grown so much in the last 5 years. 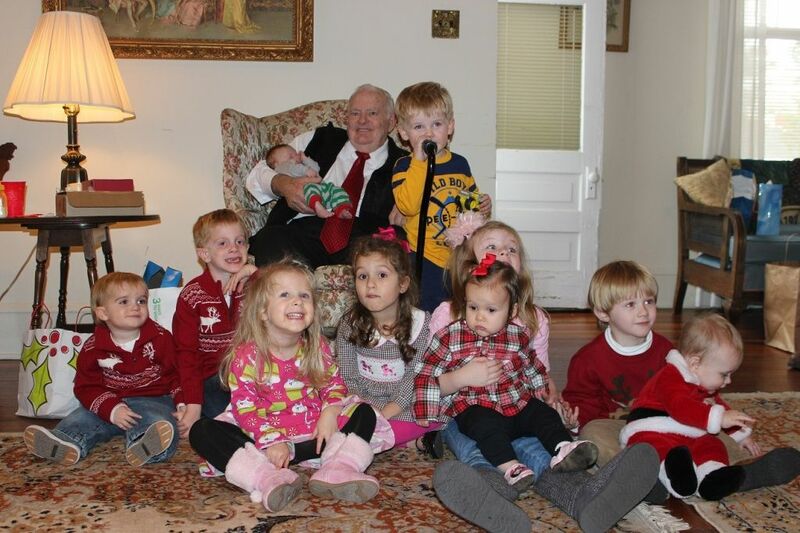 We now have 13 great-grandchildren 5 and under (Evan is the oldest), and all but 3 of them that live in Washington (soon to be Utah again) were present and accounted for. Eddie's grandfather had recently been hospitalized for a heart attack so it was wonderful that he could celebrate with us all. The smile on his face as he sat surrounded by all the kids was pretty special. 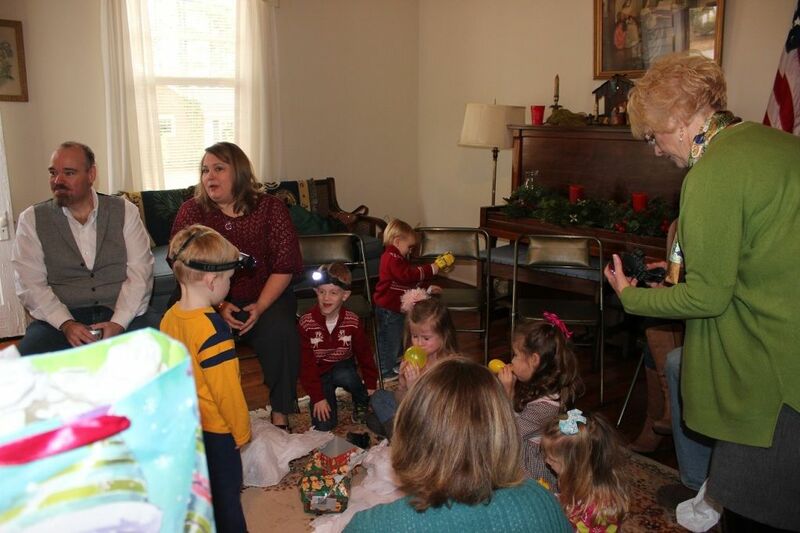 The family has outgrown any of the families' homes so Aunt Dava reserved a space at her local women's club which is located inside a beautiful, historic home in downtown Hamlet, NC. Everyone brings a potluck dish for this event, and we all enjoy eating and then a fun and festive game of "dirty santa" for the adults. That's the game where everyone brings a miscellaneous wrapped gift (our limit is supposed to be about $10), and we draw numbers to see who gets to pick a gift first. 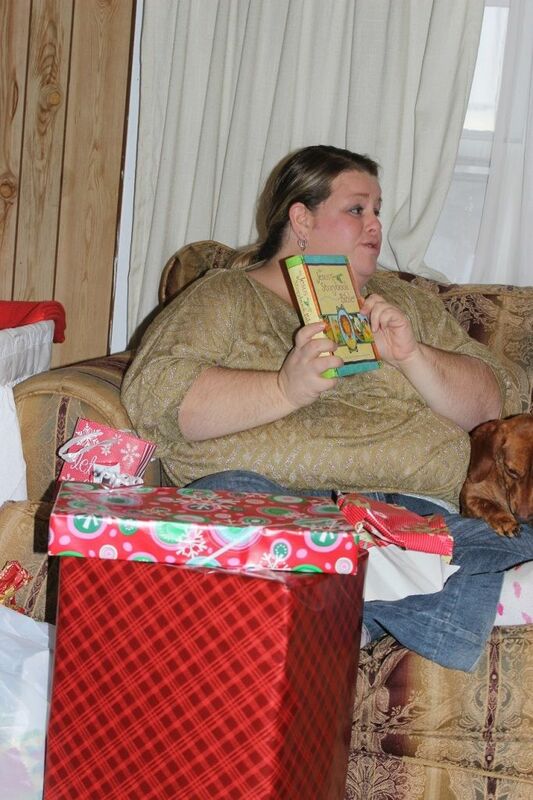 That person opens the first gift, and then the next person can either choose a new gift or steal the already opened present. You can imagine that the "stealing" can get pretty crazy sometimes. The most desirable gifts in this family tend to be the food gift cards. Ha! 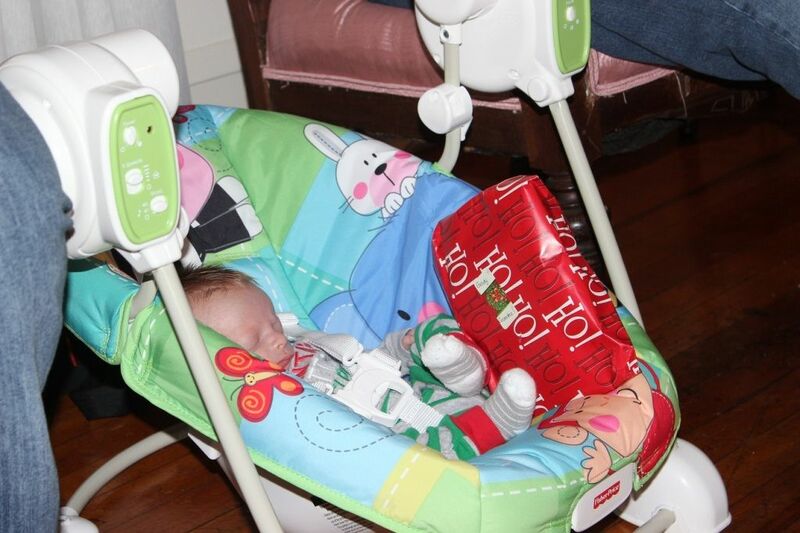 The kids usually have a little gift to open from one of their great-aunts. We all give Grandpa a gift as well. This year we added some extra craziness to the game by each person having to sing a line from the 12 days of Christmas. Of course, since there were almost 30 of us, we added some extra lines. It got crazy as each person had to remember their line to sing each time. Kudos to cousin Adam for the idea! 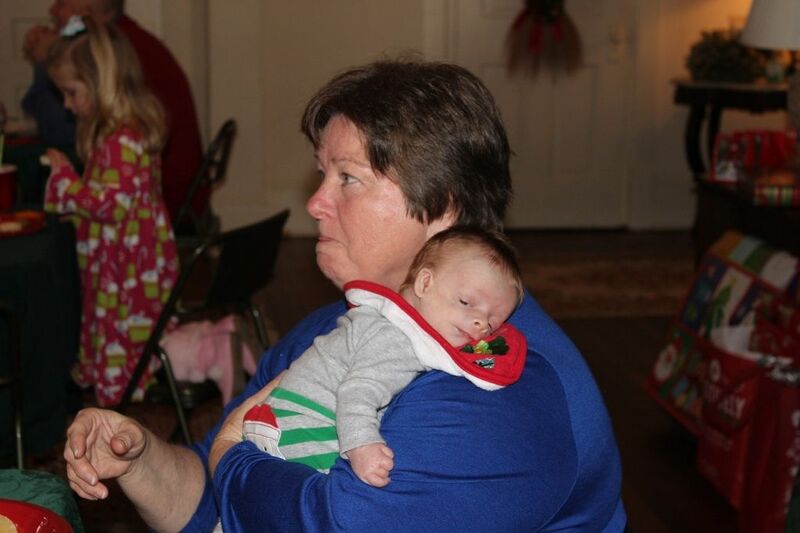 Grandma enjoys cuddling her newest grand baby, Grady. 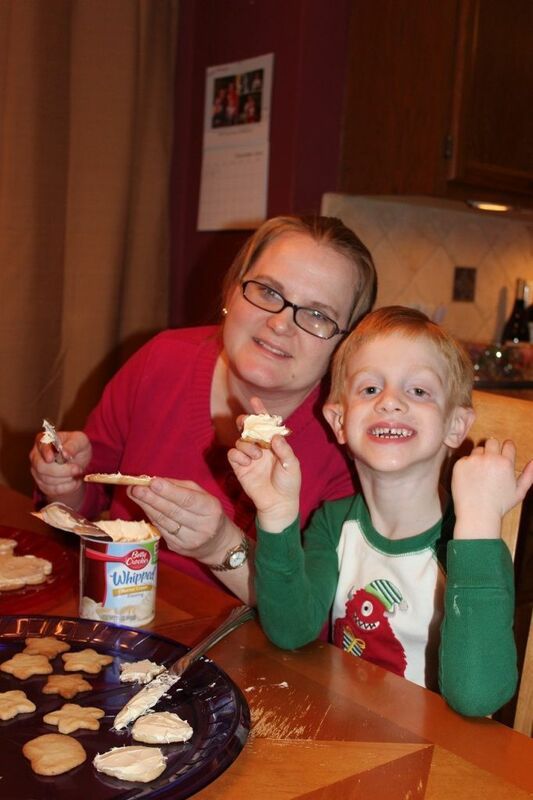 Evan enjoying some yummy Christmas treats for lunch. 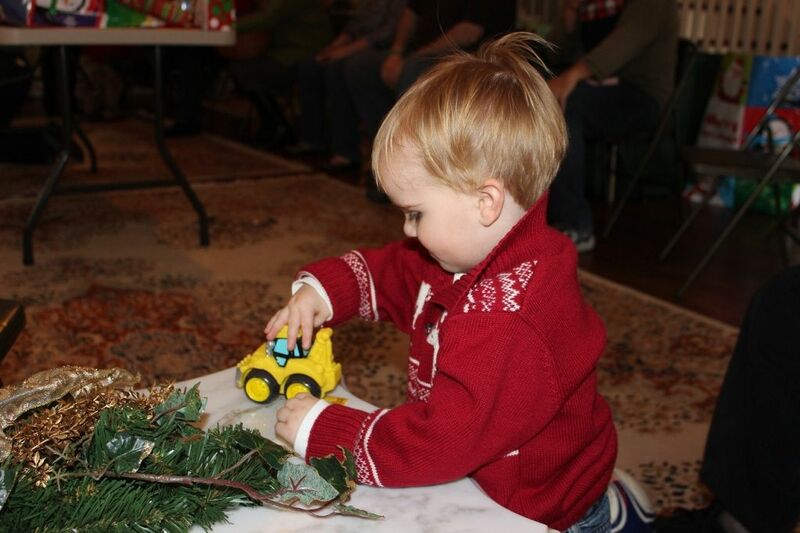 Brody loves his little truck from Aunt Dava. 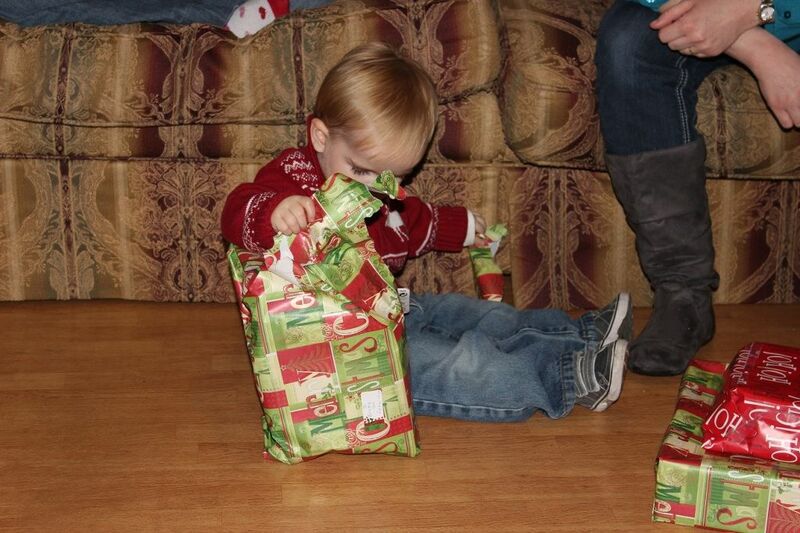 Baby Grady gets a present too. 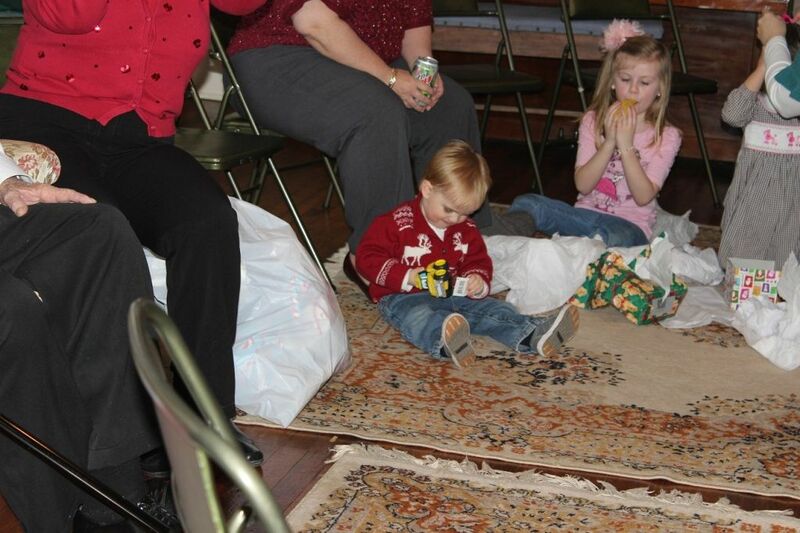 Brody and the kids enjoying their gifts. 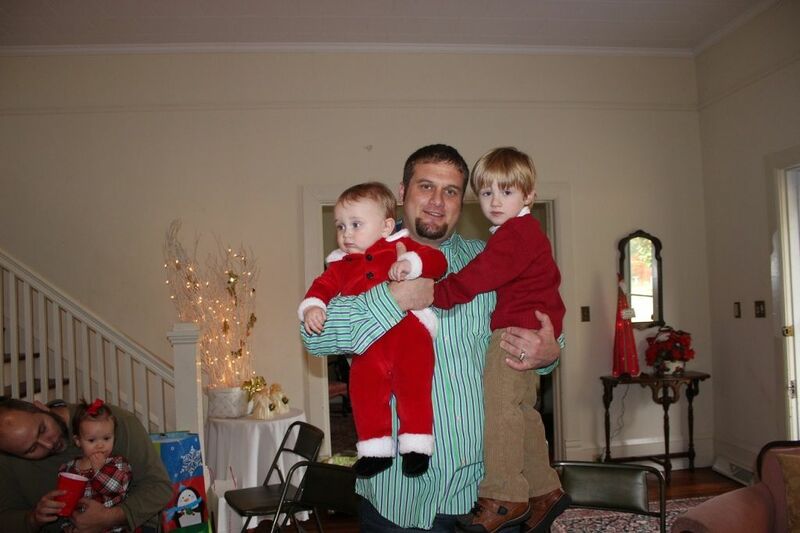 Cousin Kenny with his little men, Jacob and Robert. The boys got LED headlamps so they can blind us all. The kids enjoyed playing together while the adults had their fun. 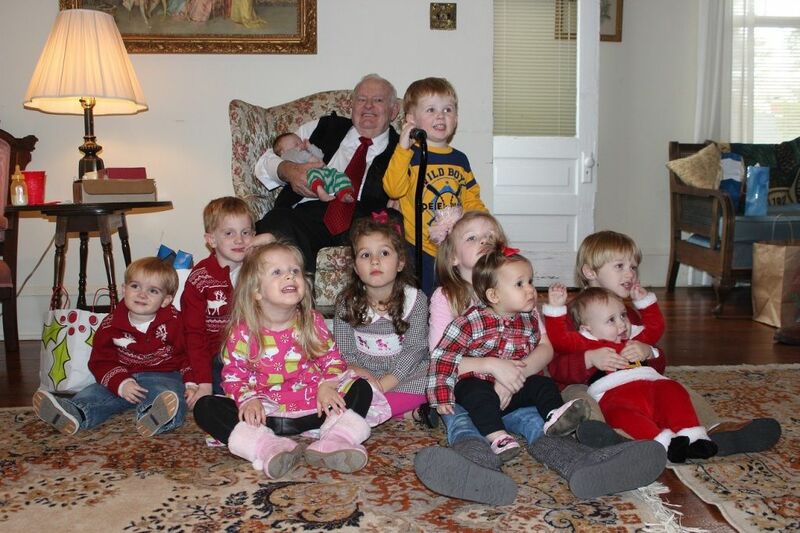 Great-Grandpa with 10 of his 13 great-grandchildren (brothers Brody and Evan, Baby Grady, siblings Mason and Lilly, siblings Elena, Eva and Emilia, and brothers Robert and Jacob). 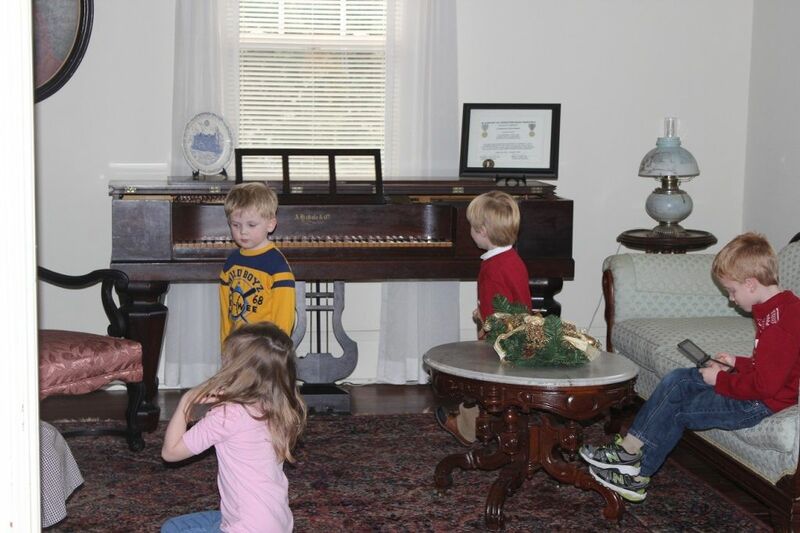 Yes, it was a little difficult to get 10 kids under 6 to cooperate. 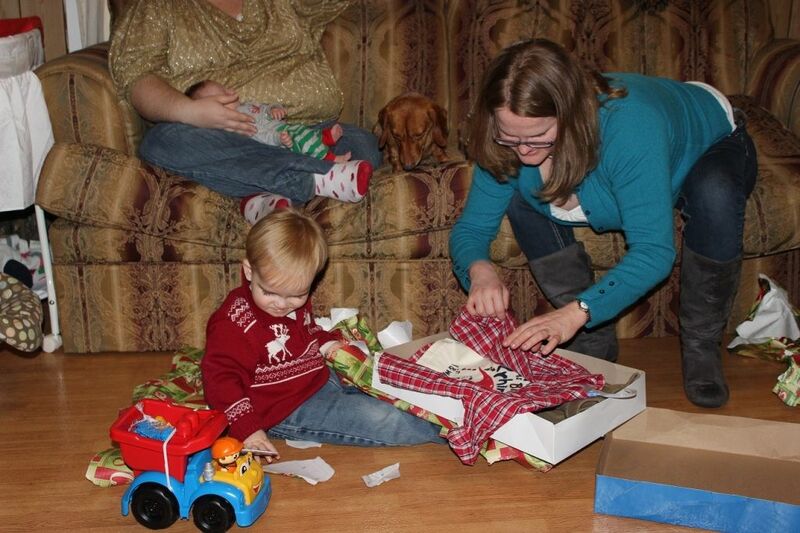 Brody enjoying opening more presents from Grandma and Aunt Naomi. And some more Lego Duplos for his collection. 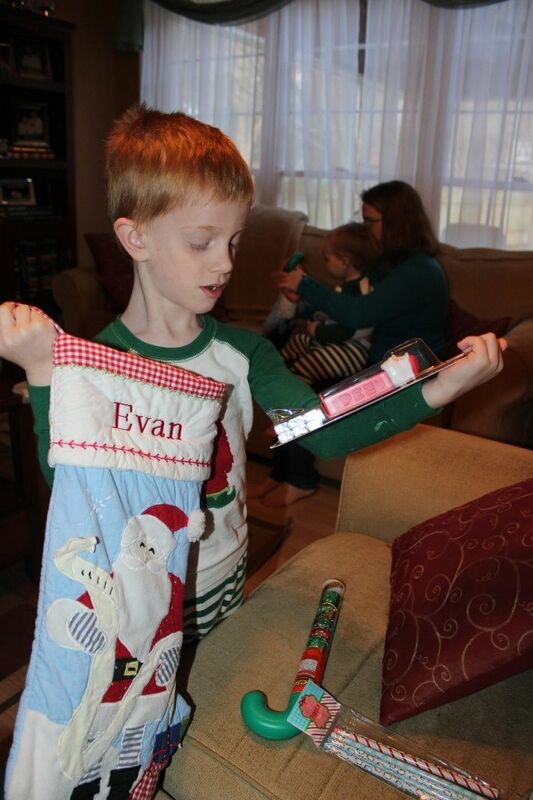 Evan's turn to open presents. 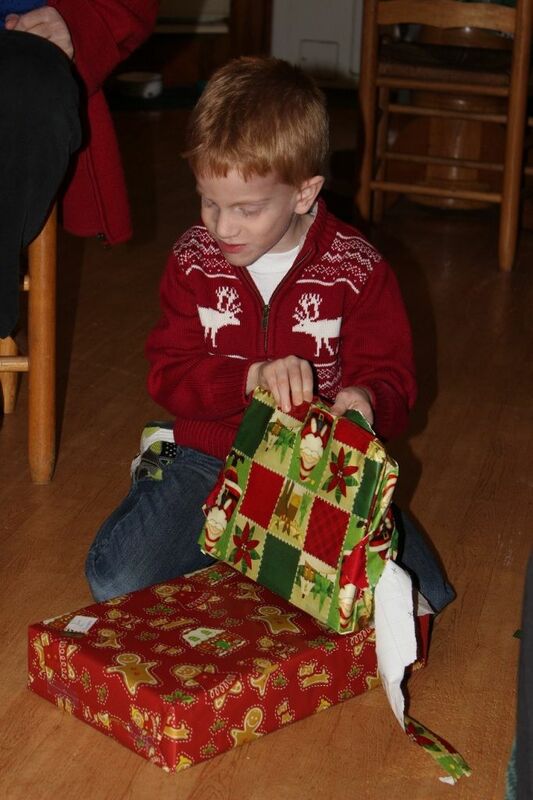 Evan with his favorite gift of all. 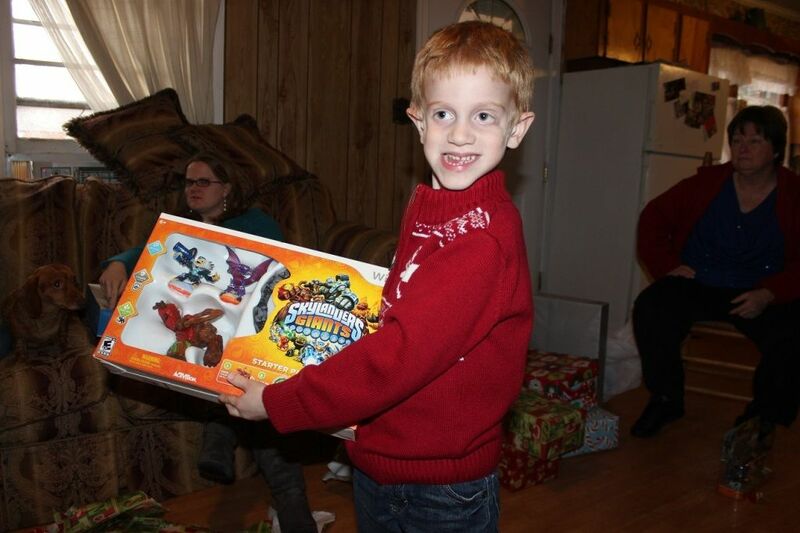 He's been wanting this game for his Wii for a long time. 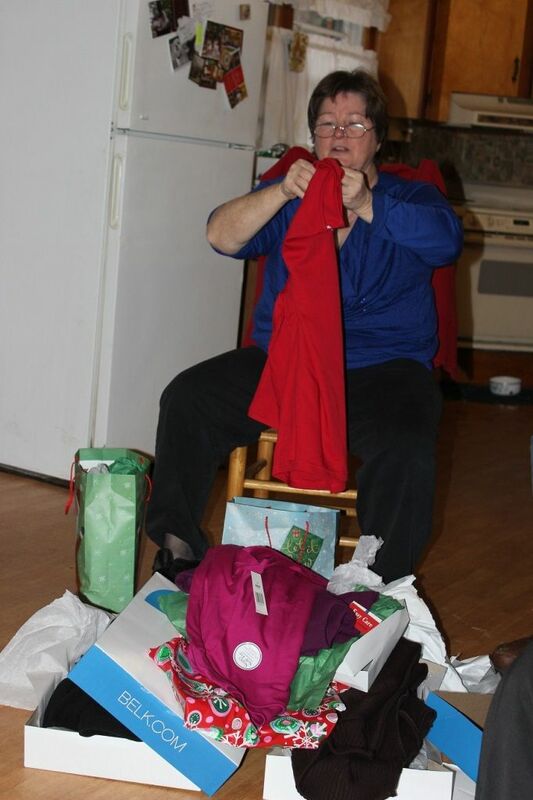 Grandma got some new clothes. 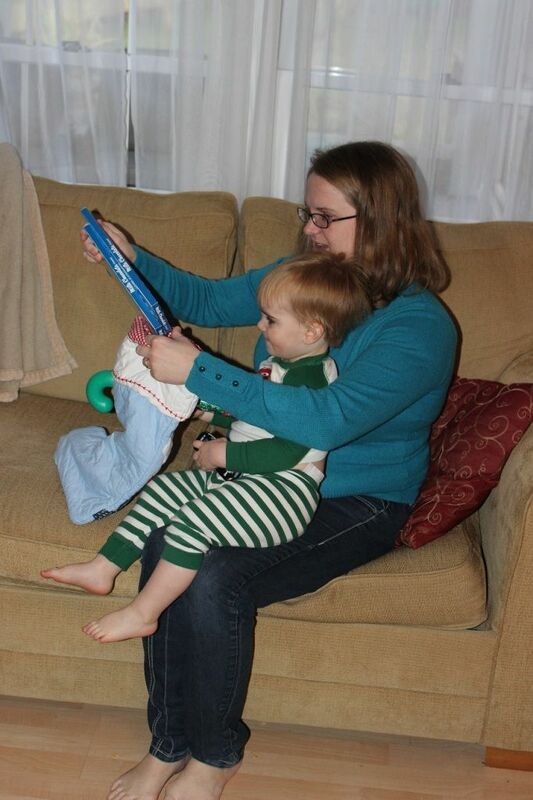 Aunt Naomi shows off one of Grady's gifts, a children's Bible from one of his Great-Aunt's. 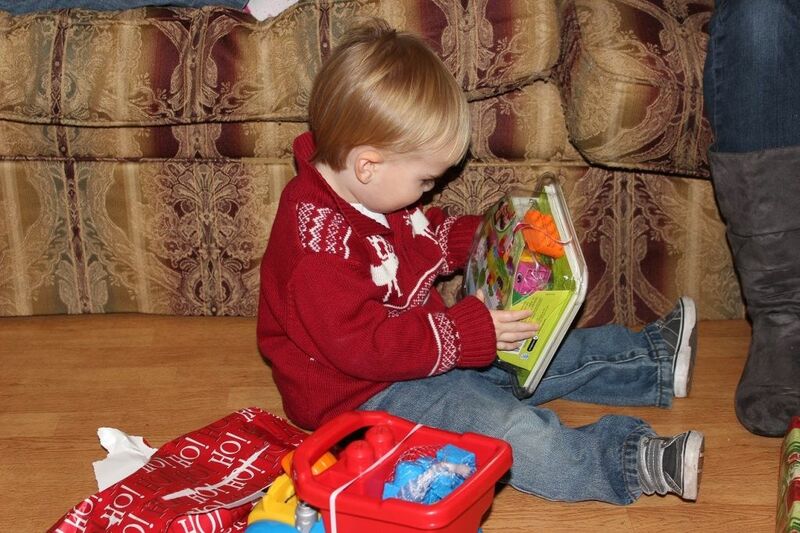 We got him a whole box of goodies (clothes, booties, socks, board books, and toys). 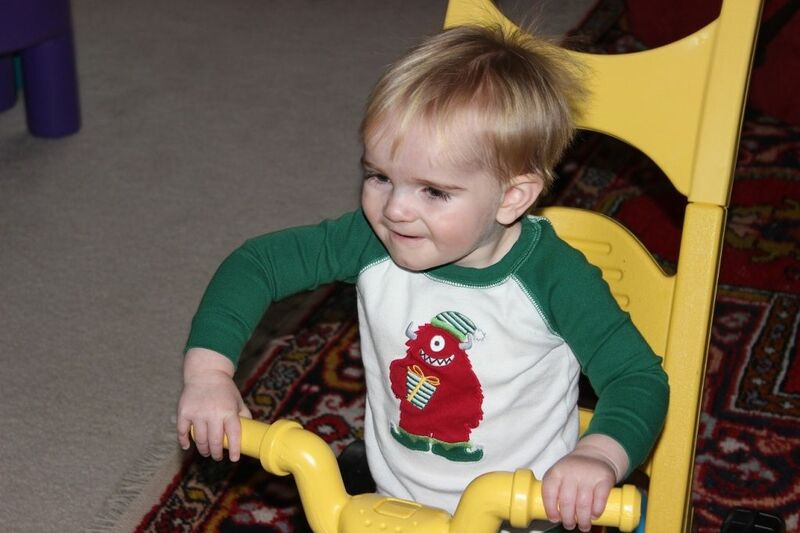 On Monday morning, Christmas Eve, we awoke at Nana's and Papa's house and prepared to travel back home to spend Christmas Eve and Christmas morning at our home. 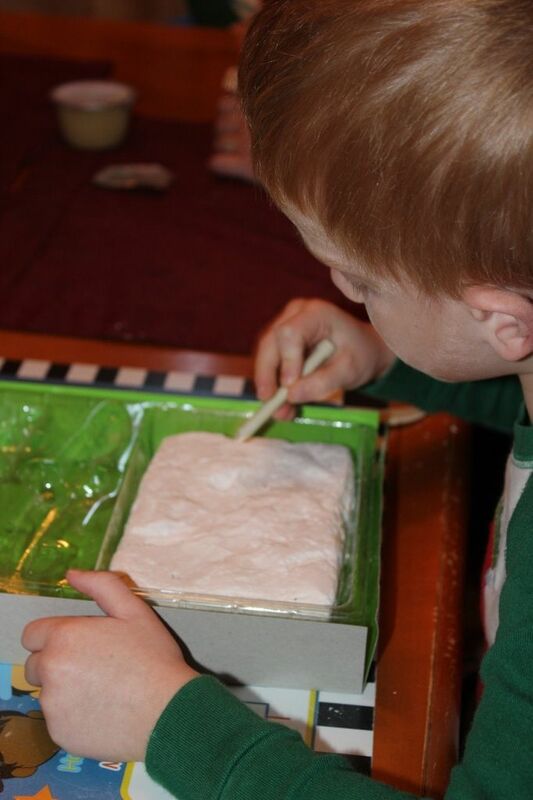 It is kind of an obsession for me to spend our Christmas together in our own home to allow the kids to have their own special memories of Christmas. Anyway, we ate a good breakfast, loaded up the car with our bags and newly received presents, and got on the road before lunch. 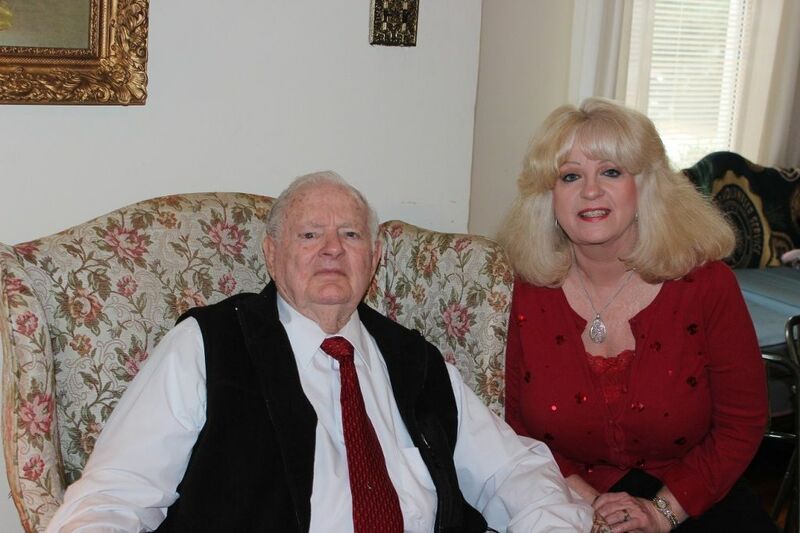 One thing that I had to do on the way home was stop for lunch at a place in the Raleigh/Cary area that holds a lot of significance to Eddie and I. 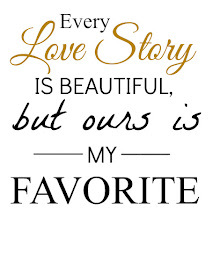 When we were dating and both still in college, we would both be done with classes on Fridays before noon so we would have lunch together and just spend some time together in the afternoon before we each headed our separate ways. 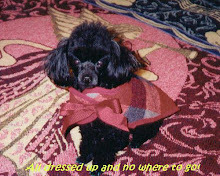 Eddie often went to work (we both worked at Best Buy at the time, but he was the one who usually worked on the weekends), and I usually headed home to my parents' who then lived about 45 minutes outside of Raleigh. 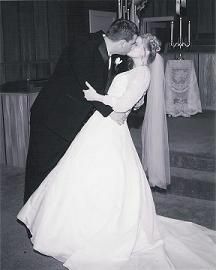 One of our favorite eateries for these occasions was a little local chain called Remington Grill. I know I mentioned before that I really love our good ol' eastern NC barbecue; however, I do not like it to the exclusion of all other forms of barbecue. This little establishment boast my favorite beef brisket sandwich with the yummiest western style barbecue sauce I've ever tasted. Anyway, it just makes me smile to sit in one of the same booths that we used to occupy when we were a lot younger and newer in this whole love business. The kids also enjoyed the fun western theme of the restaurant, and Evan kept asking if the cactuses (technically "cacti" but that's not how most people would probably say it) were real and if he could touch them. Ha! Anyway, after our stop for lunch in which we were thankful we weren't joining the throngs of people still out finishing their Christmas shopping, we made it home by 4:00 to begin our necessary preparations for Christmas. 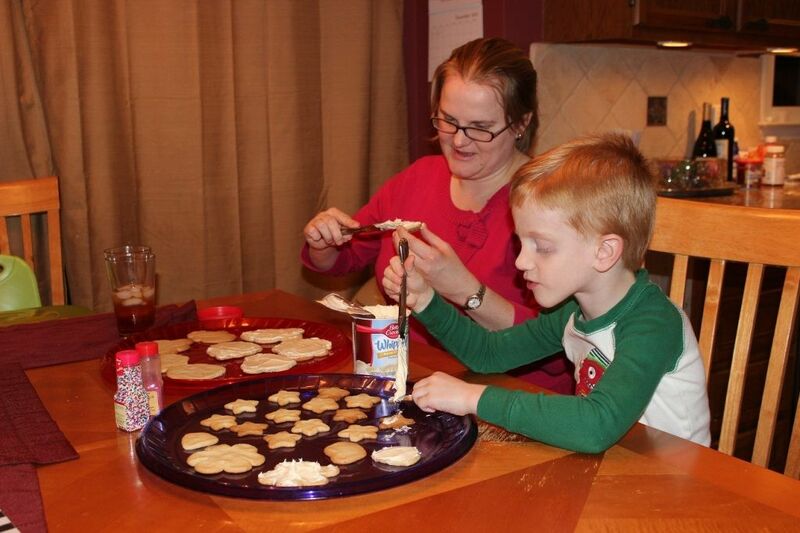 Of course, there were cookies to make for Santa (store bought dough and icing did the trick), and a birthday cake to bake. We usually try to attend our church's Christmas Eve service, but since it was so late already, we decided to order pizza and watch one of our movies about the real reason for Christmas. 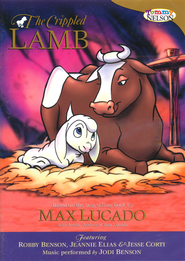 The first year I tried to incorporate a movie like this into our tradition with Evan, we watched Max Lucado's The Crippled Lamb. Evan got a little upset and sad during one part of this movie (he is so sensitive) because the little lamb is confronted by a scary mountain lion. Of course, the shepherd saves the lamb which is symbolic to the story of Jesus as a shepherd caring for us, his sheep, but it was hard to convince a young 3 year old to give the story another chance. 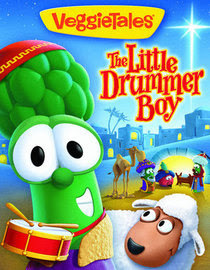 Last year, we chose a happier version of the Christmas story -- The Veggie Tales version of The Little Drummer Boy. He was happier with this version and even Brody liked the music and laughed at the funny veggie characters. After the movie, the boys were tired. Brody had already fallen asleep, and Evan was almost there. 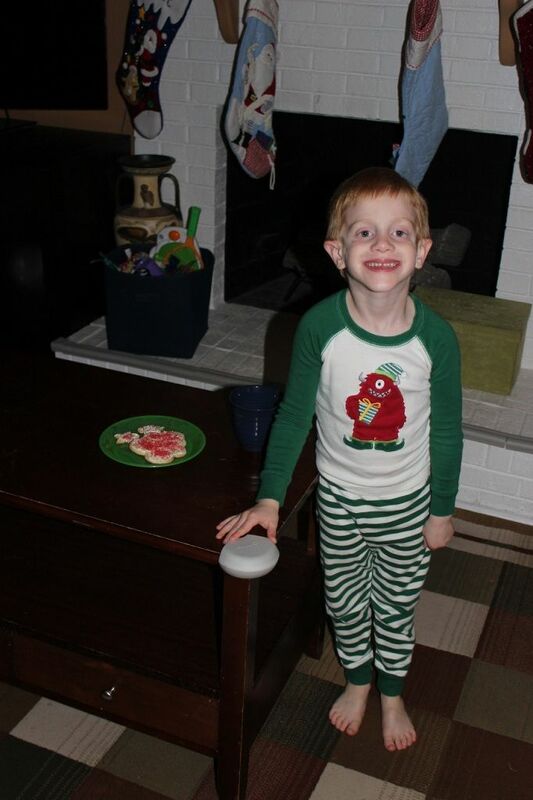 We put out the milk and cookies for Santa, and after both boys were snuggled in their beds dreaming of sugar plums, we headed back downstairs to "assist" Santa with his nightly duties. 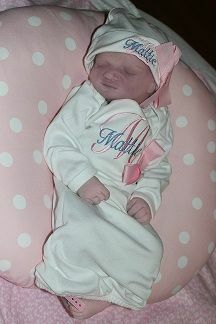 Well, it was a little hard for Mommy to drag herself back out of bed to help, but she managed. 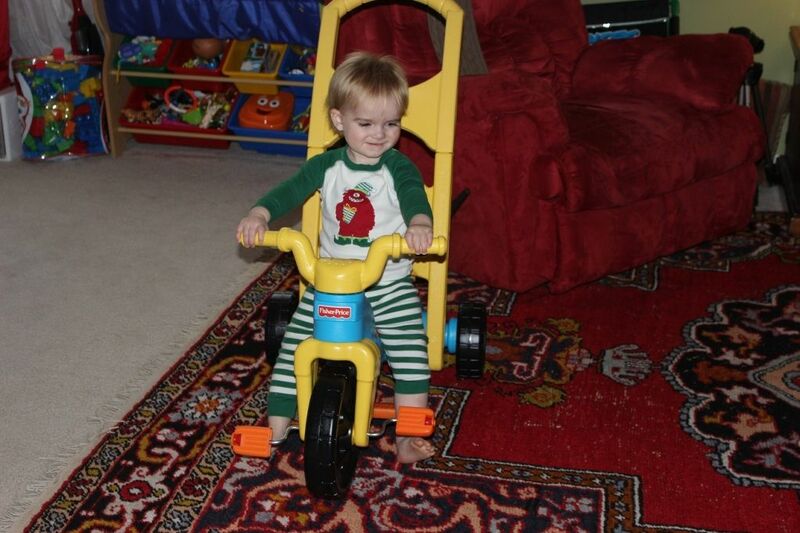 Eddie had the toughest job putting together Brody's new tricycle. 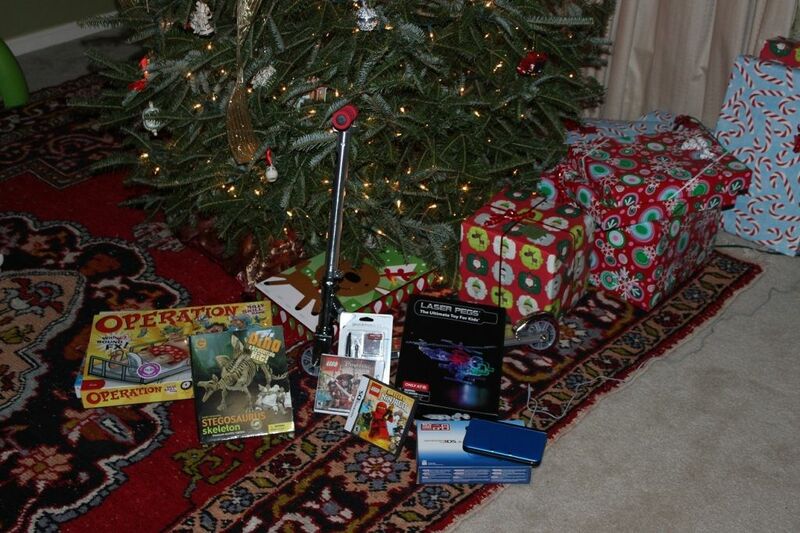 I opened and set up the rest of the boys' gifts and stocking stuffers. It didn't take us too long, and we were soon back in the bed. 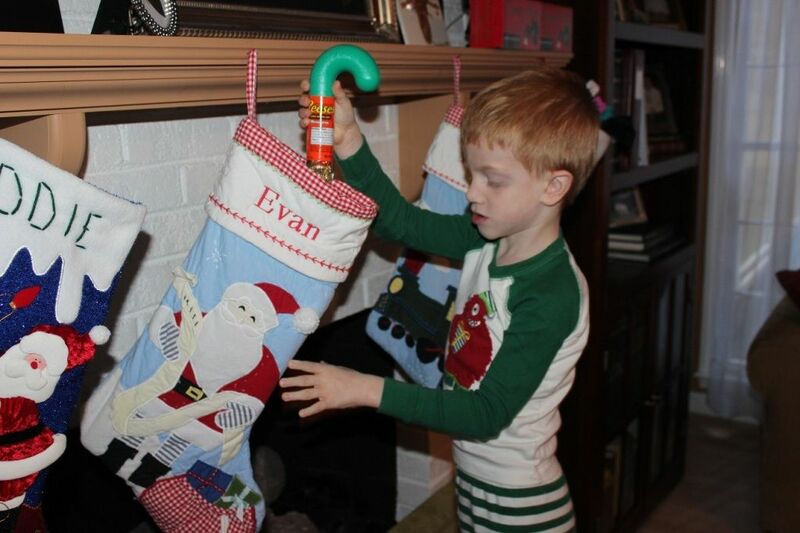 We have been thinking every year that Evan is going to be so excited that he won't be able to sleep or he'll wake up super early to see what Santa brought, but Evan is just so much like his mother and loves his sleep. He and Brody slept until after 8:00 the next morning, and Evan had to be reminded when he woke up about the events of the night. 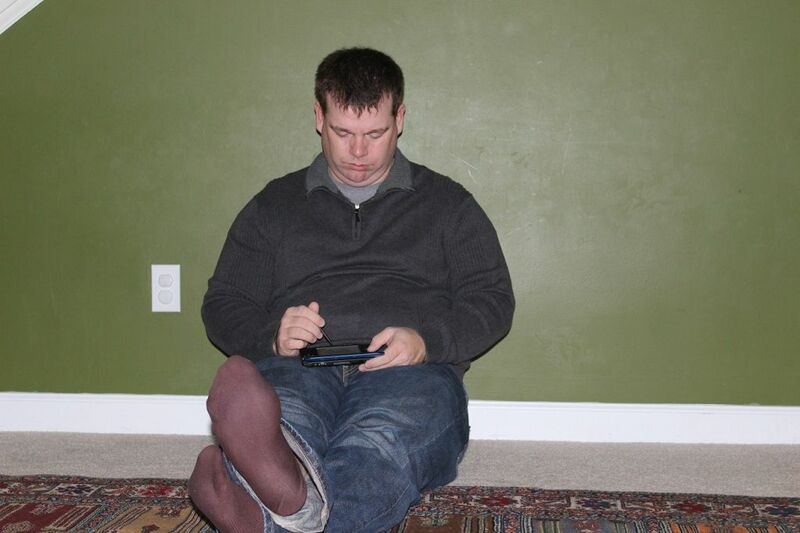 Of course, then he couldn't wait to get downstairs. Eddie and I are thankful that we are able to shower and dress before the boys wake up, but we wonder how long this blessing will last. 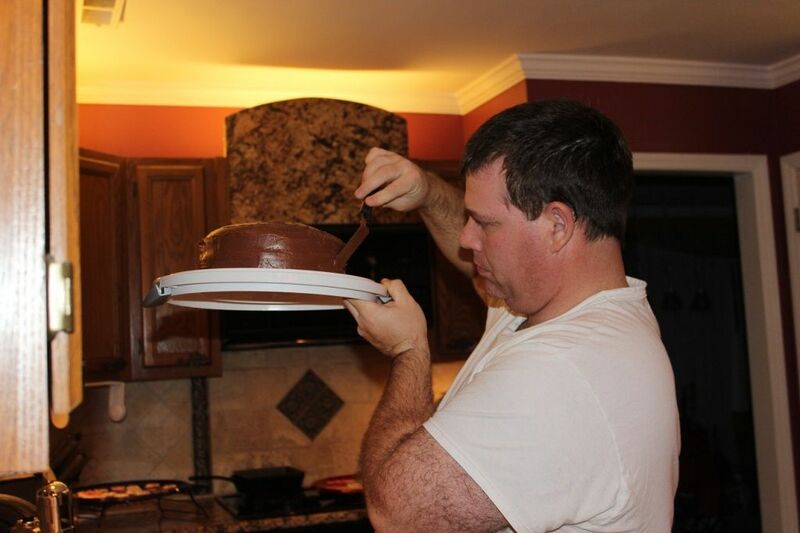 Evan pretending to be a cake baking ninja, I think. 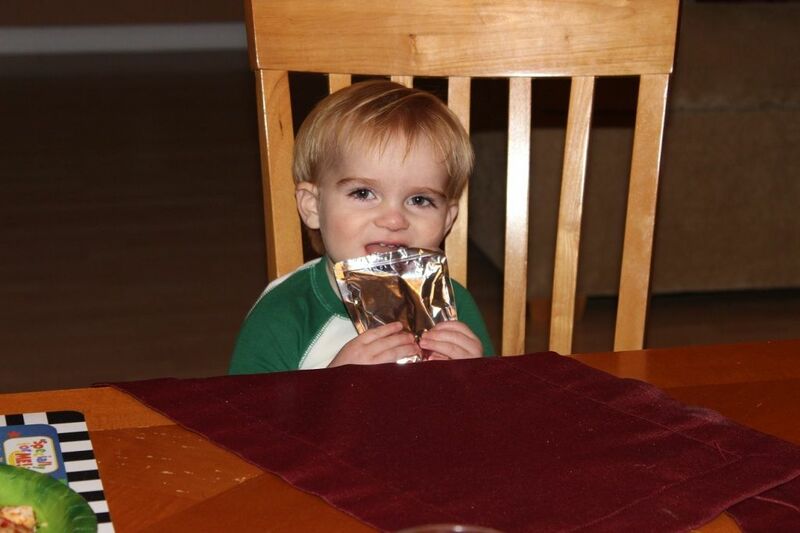 And Brody stole big brother's juice box while he was busy making the cake. 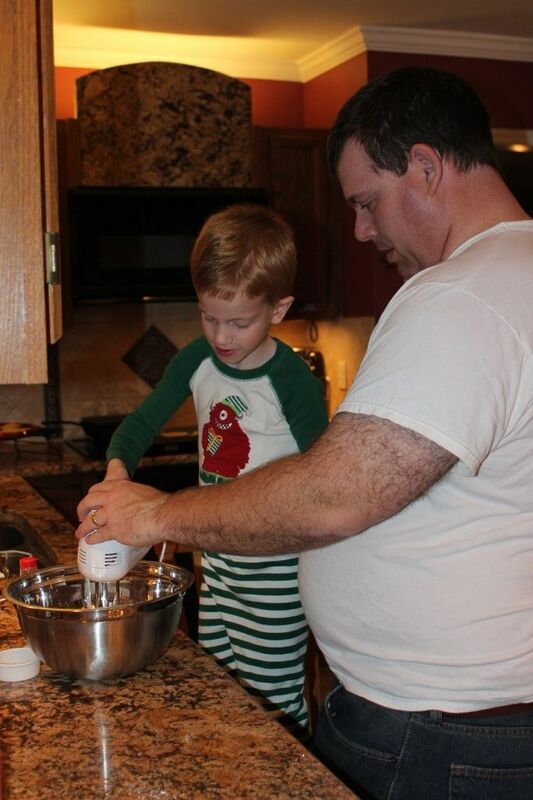 Evan is a pro with the mixer. 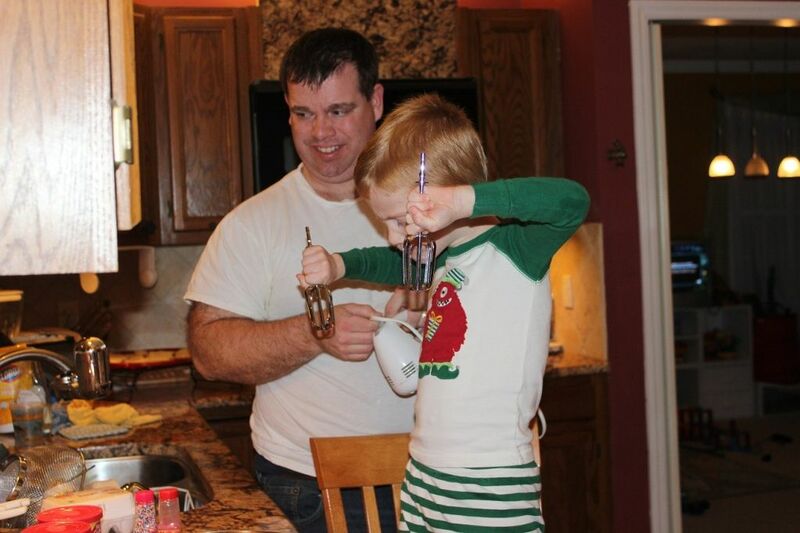 He also enjoyed helping ice the cookies this year. Our cheese faces for Daddy. 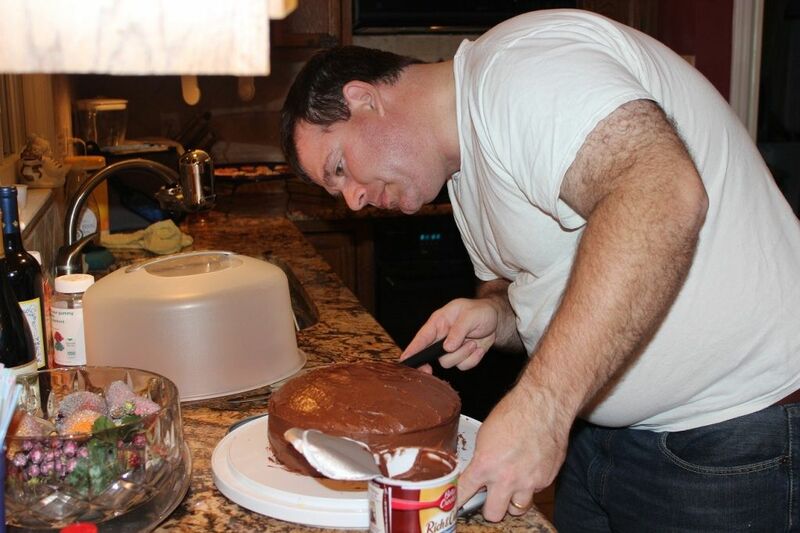 Daddy icing the cake like a professional. 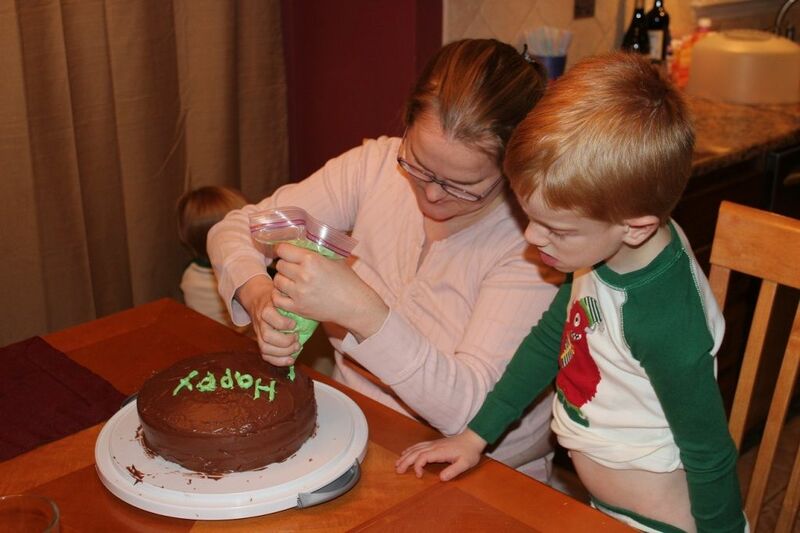 Not the neatest job we've ever done as I improvised with just white icing, some green food coloring, and a ziplock bag. Ready for the celebration! Sprinkles make anything look better, right? 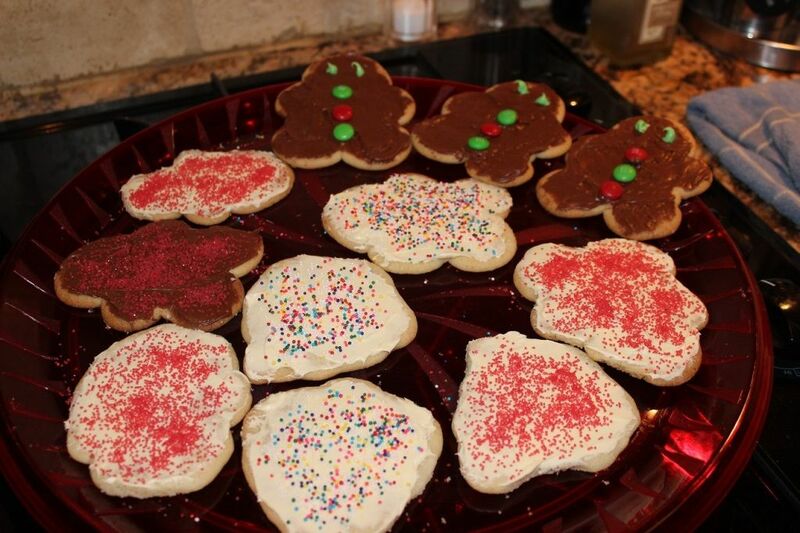 Some of our cookie masterpieces. Nope, these probably aren't pinterest worthy, but they were pretty yummy. 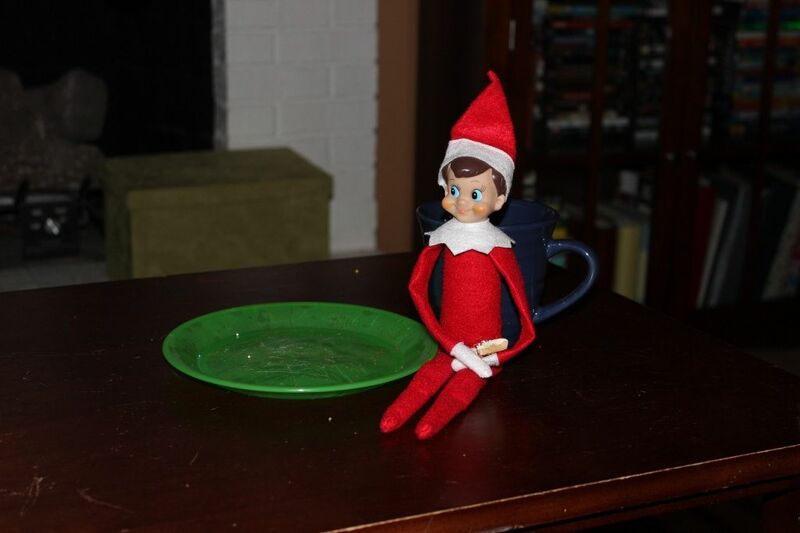 Setting out the cookies and milk. 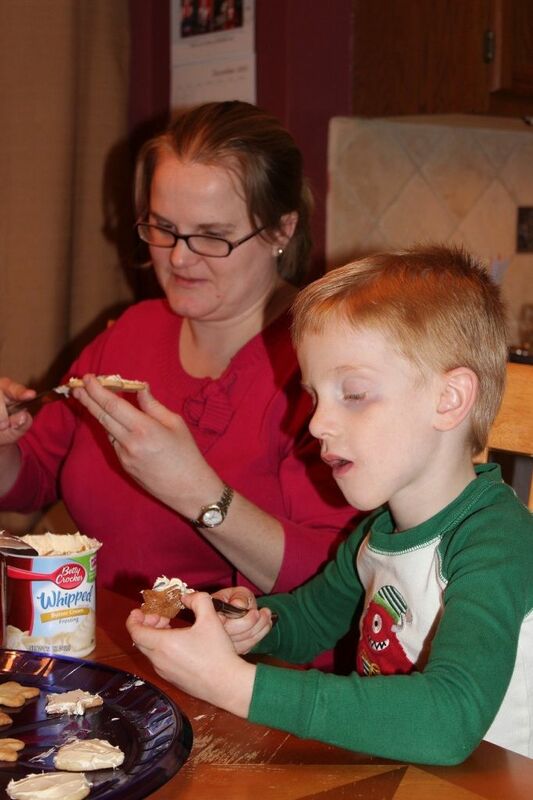 We had some reindeer food from Brody's school, but I couldn't find it. Ooops! 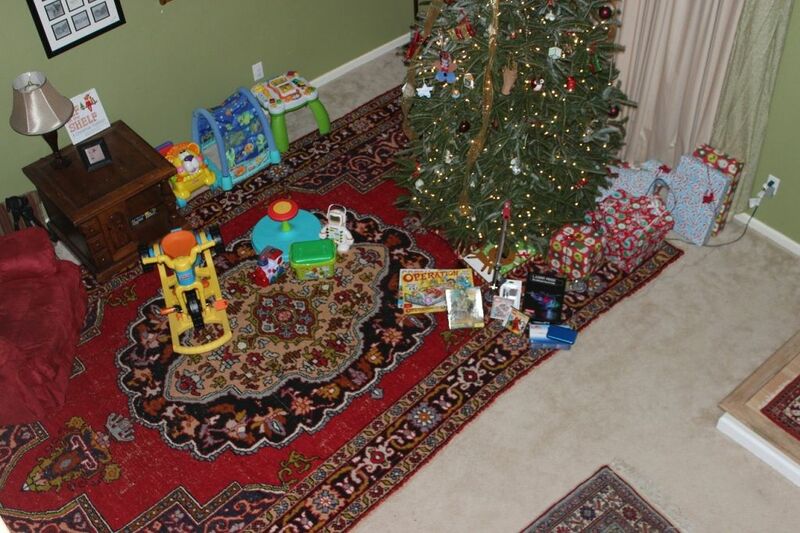 I think Santa has been to visit. 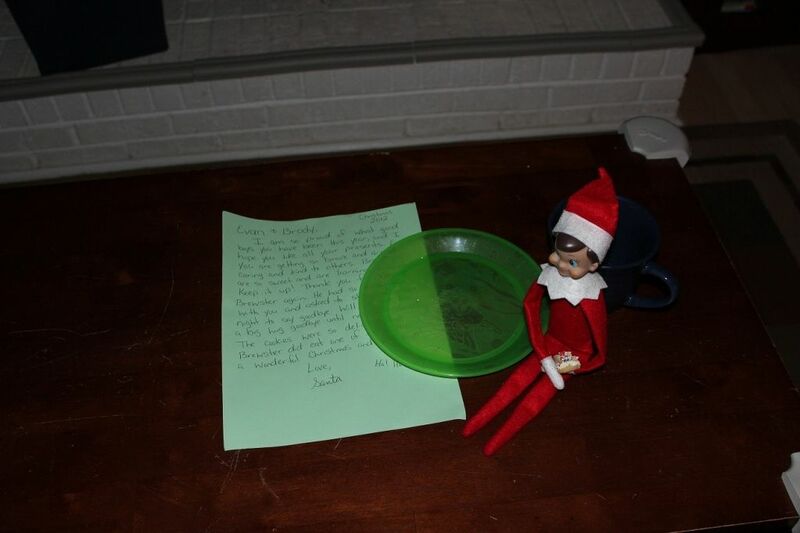 Awww, Santa let Brewster stay a little longer to say goodbye, and Brewster even snuck a little of Santa's cookies. Santa's letter to the boys telling them how happy he was with all they had accomplished this year and asking them to give Brewster big hugs before he leaves for the year. 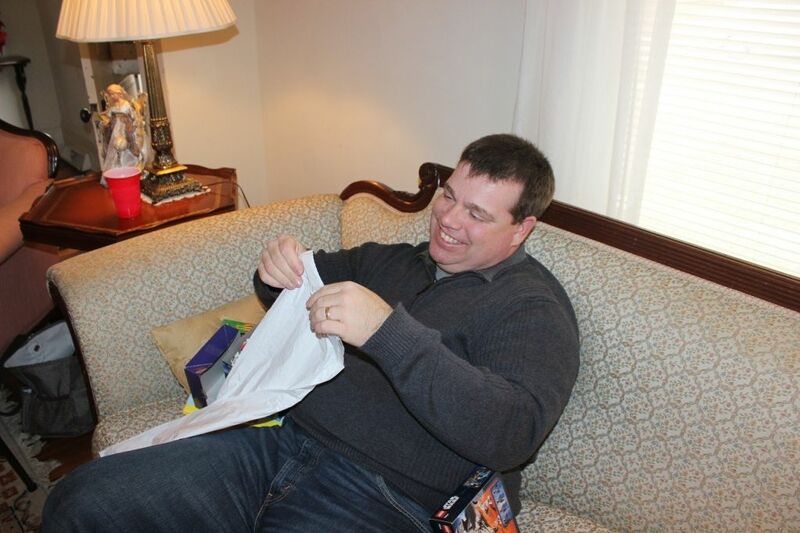 The stockings were stuffed. 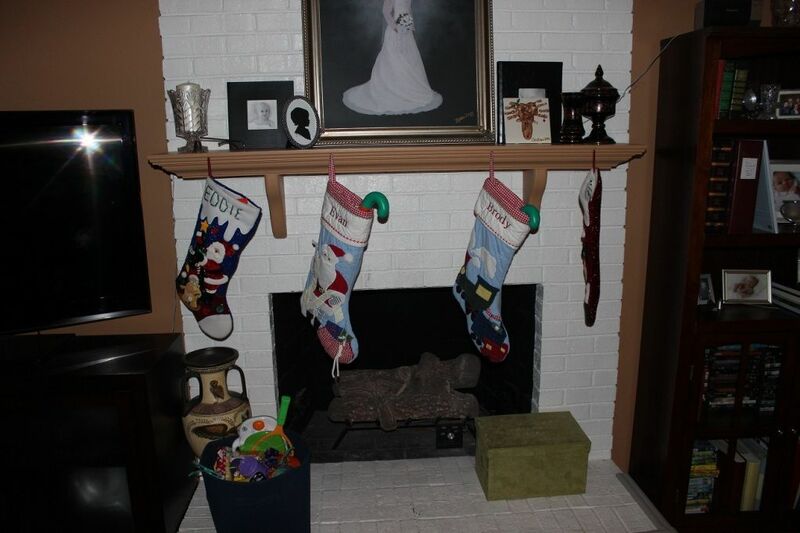 Apparently, Santa did sneak back after I had gone to bed and filled my stocking. 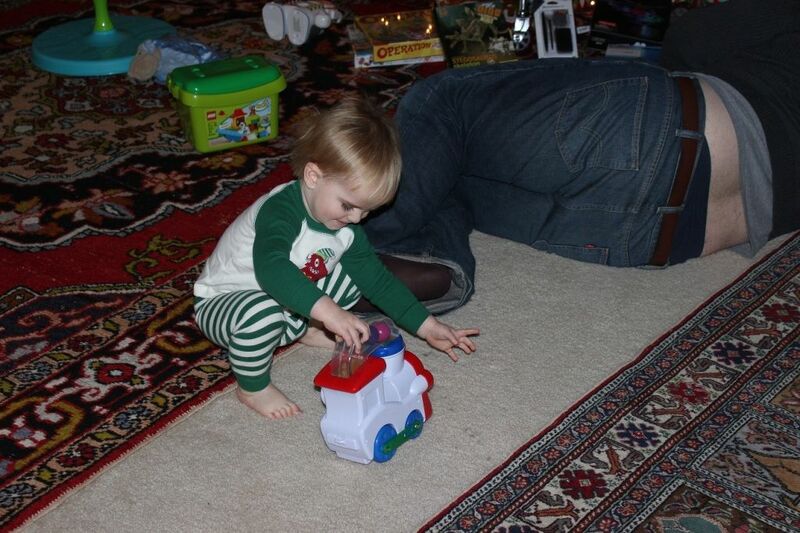 Eddie and I don't give each other much for Christmas...it is pretty much just about the kids for us. But Eddie does have a tradition of giving me some yummy chocolate covered cherries and picking out some new underwear for me. Silly guy! 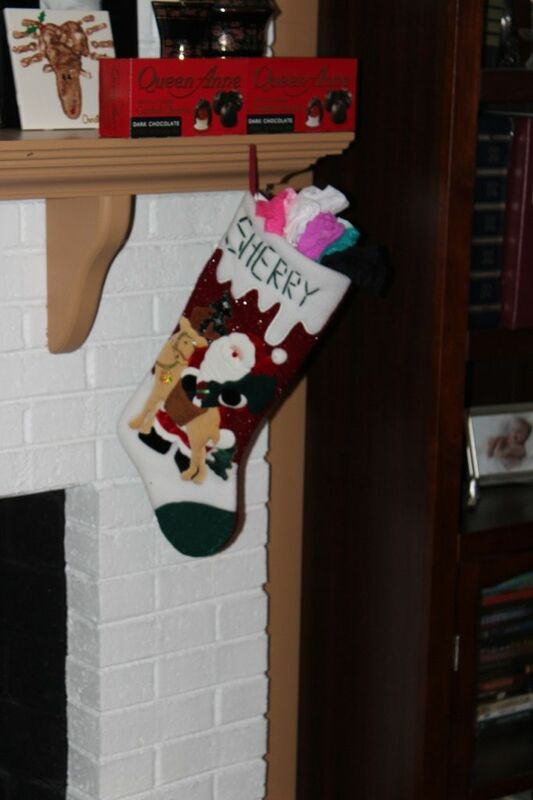 I put some chocolate treats in his stocking too. The boys are up and ready to go. 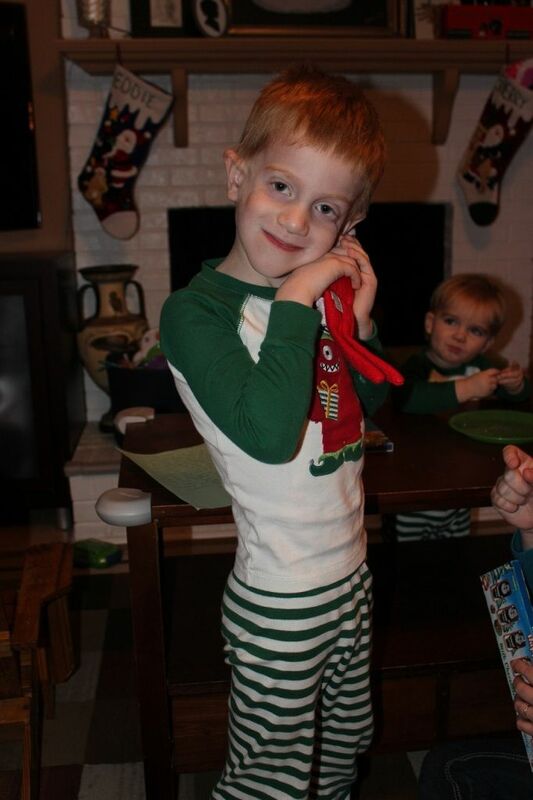 Evan was pretty pleased that Santa got him what he asked for. 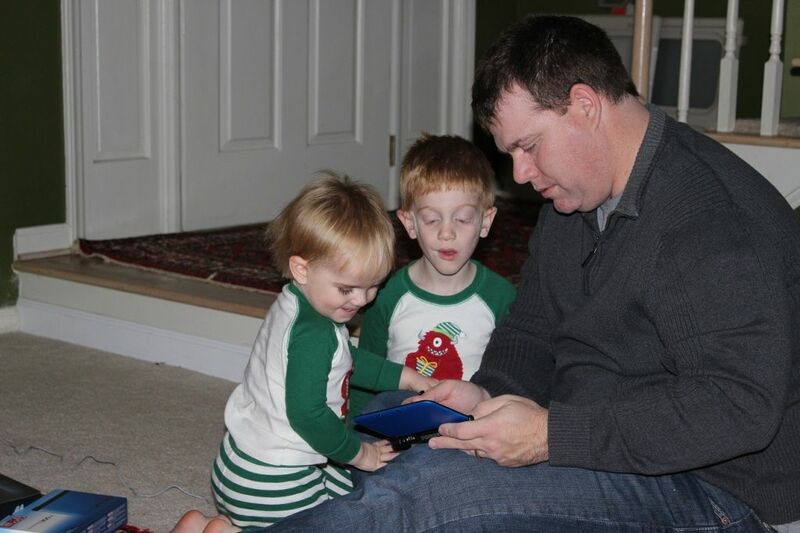 Daddy showing the boys how to set up the new Nintendo 3DS. 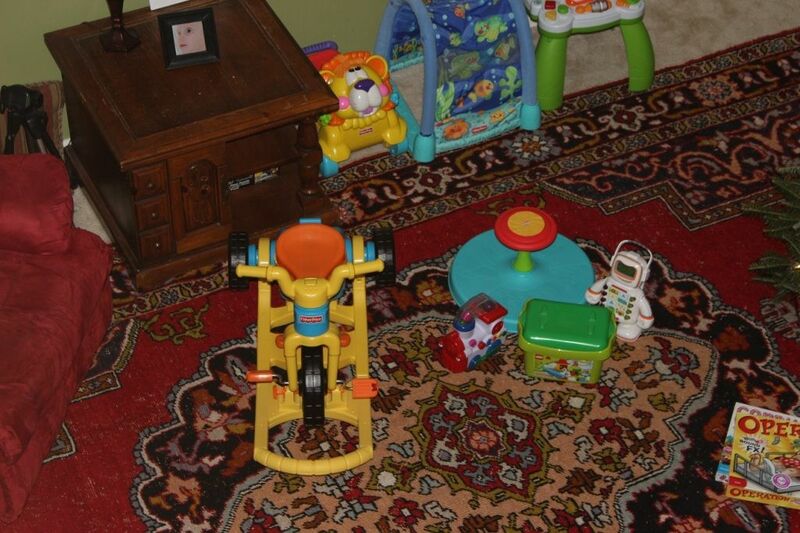 Brody knew what to do with his bike right away. Cutie bug. We were going to leave it as a rocker for now for in the house use, but he wasn't content with just staying in one place. 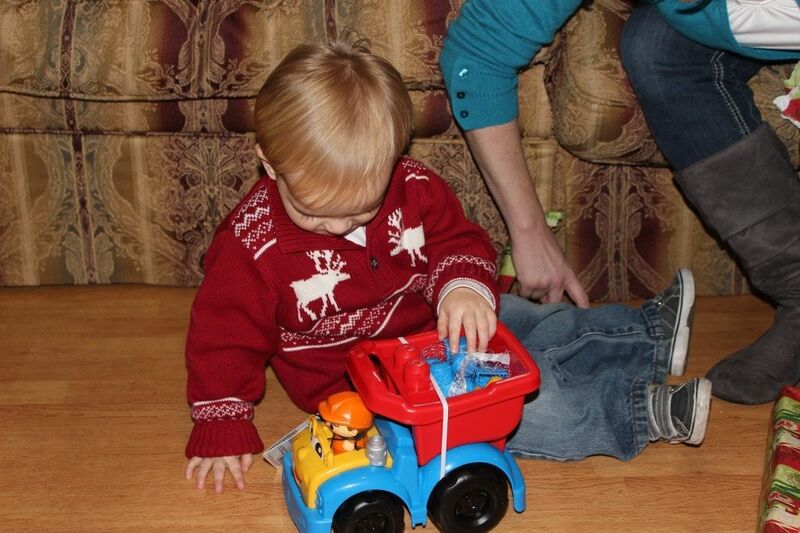 Brody picked this little train out at the store. Taking a break for some music. 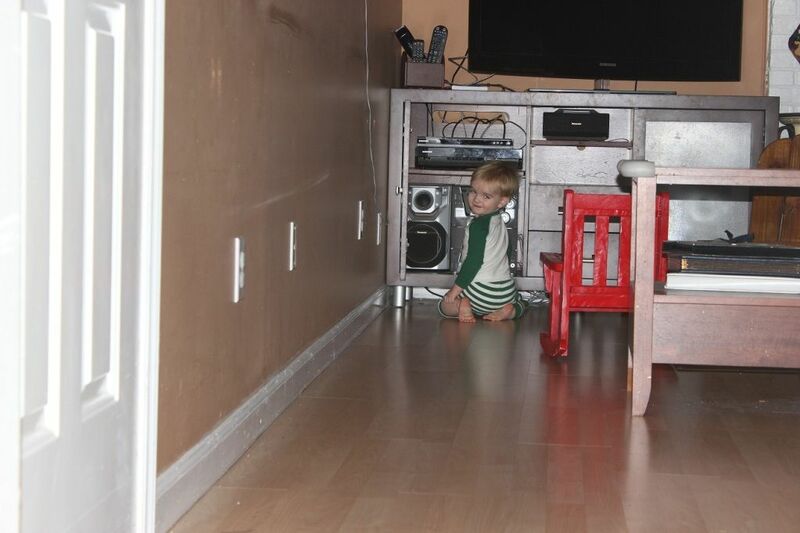 This kid loves playing his music LOUD! 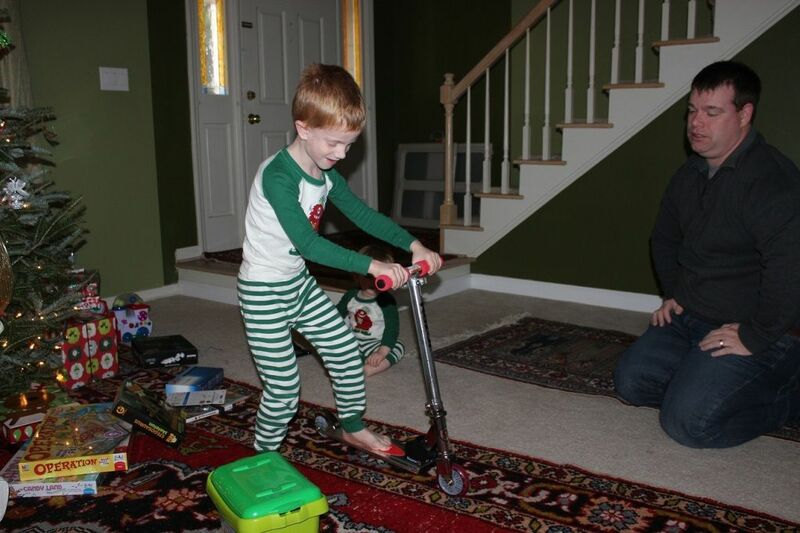 Evan trying out his new scooter. 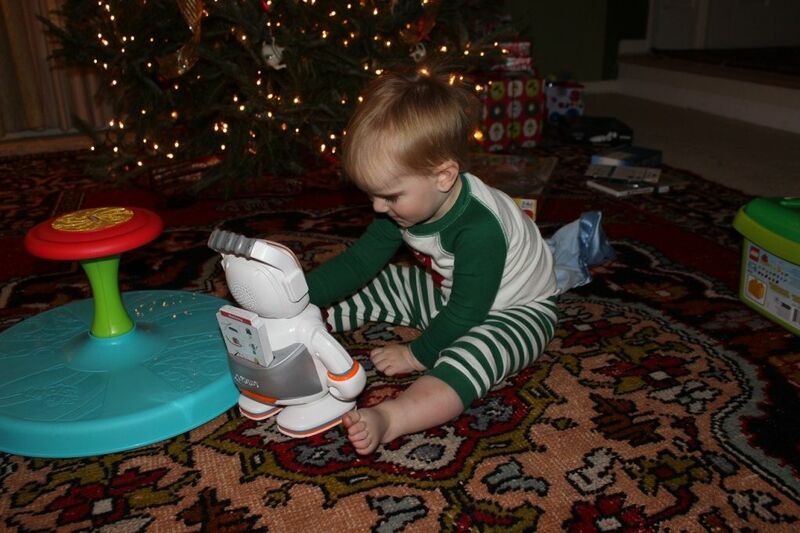 Brody loved his new robot pal, Alphie. 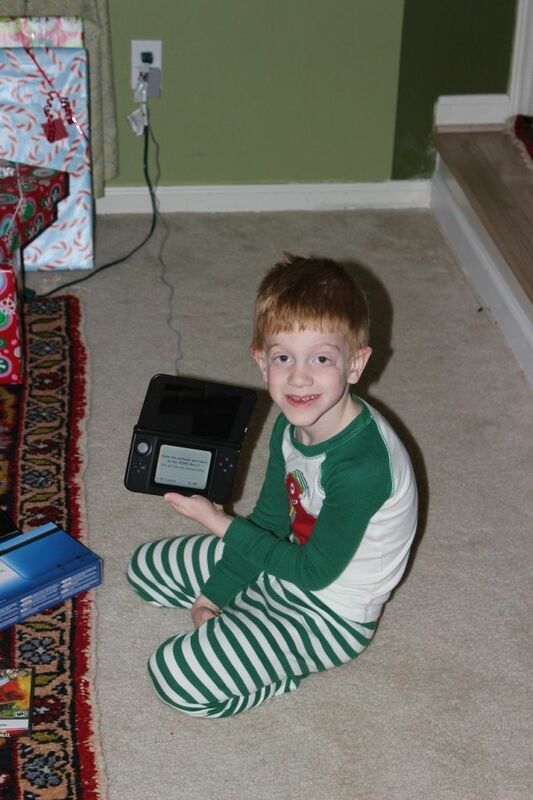 Ahem, who got a new DS for Christmas? 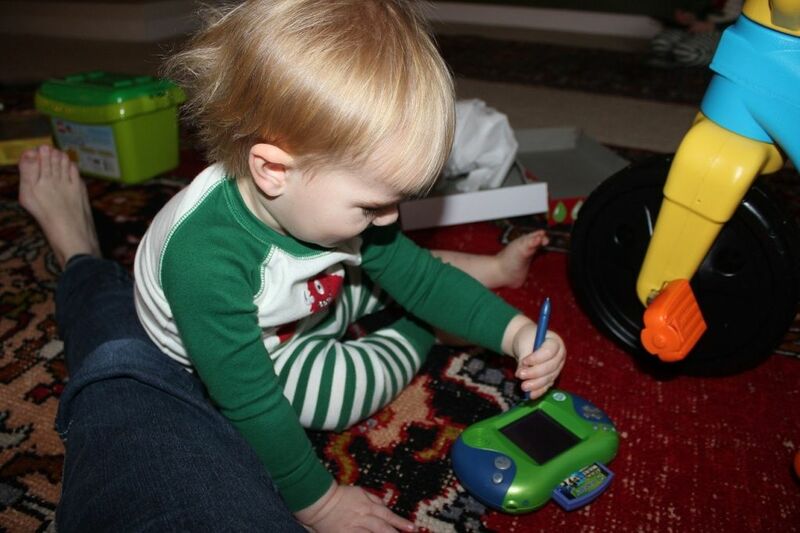 Brody decided that since brother got a new game system for Christmas, he could have the old Leapster. A new pez dispenser is always fun. Brody got some chocolates too. 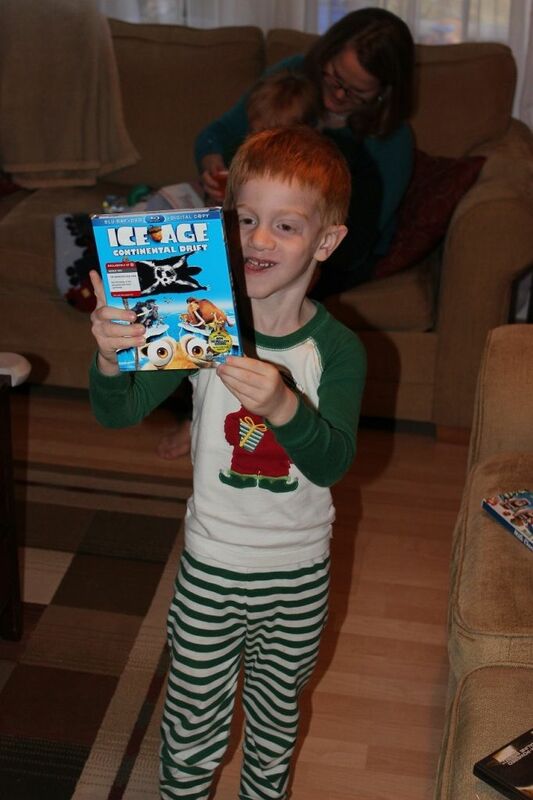 Evan is excited to watch the new Ice Age movie. 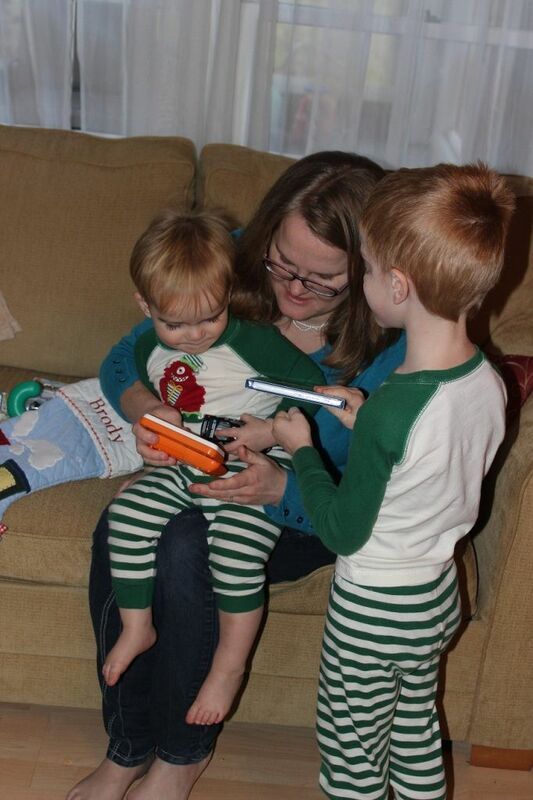 Showing Brody his new cell phone. 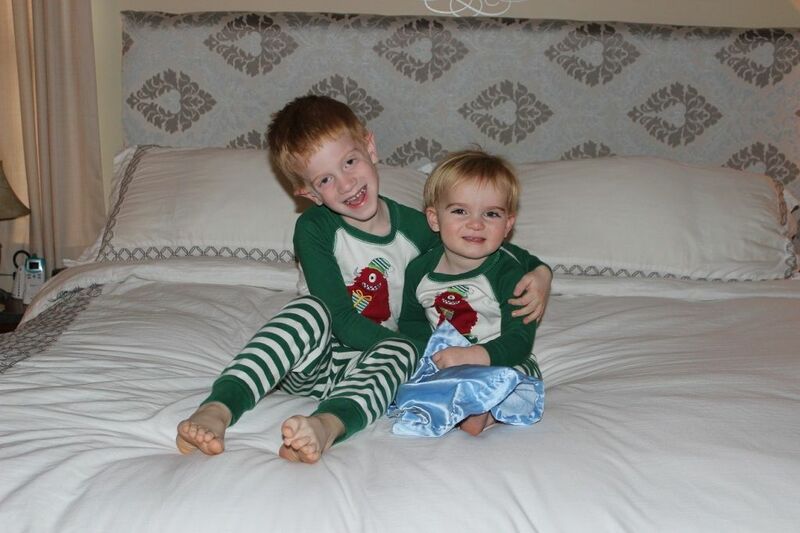 Evan giving love to Brewster as Santa instructed. 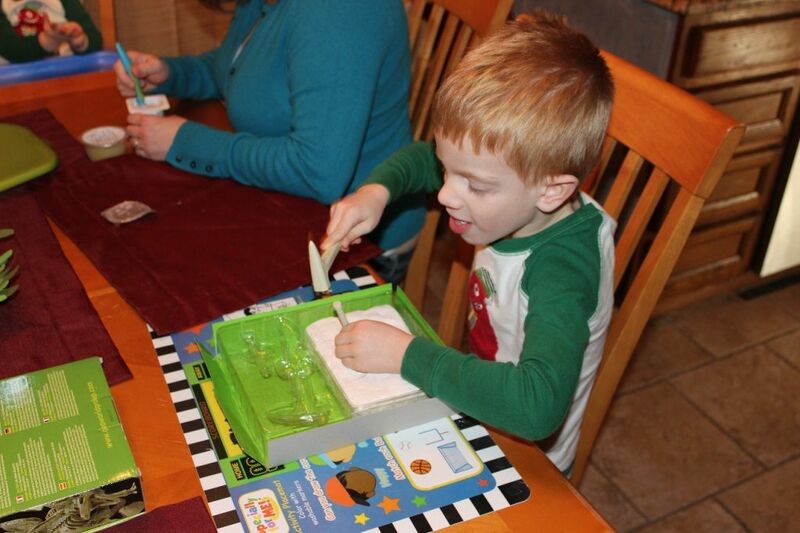 And he couldn't even wait until after breakfast to go to work on his dinosaur fossil. 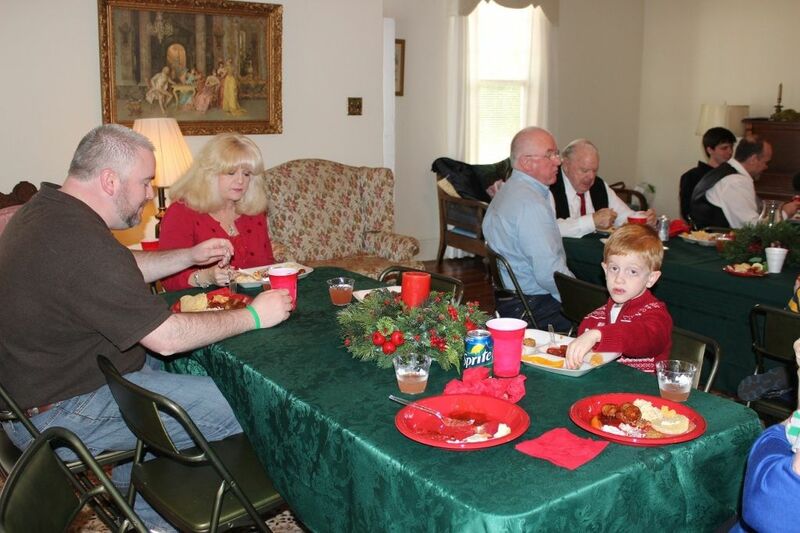 Next, we pack up to head to Grandma's for Christmas lunch with the whole clan. Lot's more fun ahead!